Brookwood Cemetery first opened in 1854 and was at one time the largest cemetery in the world. Today, it continues to be the largest cemetery in Western Europe and since its opening, approximately 250,000 people have been laid to rest within the beautiful grounds. 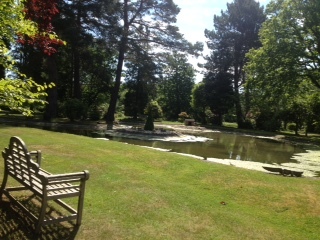 It is near Woking, Surrey, adjacent to the A322 Guildford – Bagshot Road (Junction 3 off the M3). Recently, Woking Branch Arranger, Susan Areington visited Brookwood Cemetery to meet Kim Lowe to view the updated and extensive data base at the cemetery office. The Woking Branch works closely with Kim, Kevin and staff with each new and existing Memorial Enquiries. Also based at the Cemetery is The Brookwood Cemetery Society Lodge, adjacent to the cemetery office. Public guided tours around the Cemetery are held by the Society on the first Sunday of every month from March to November. All monthly walks start at 2pm unless otherwise indicated. Walks last around 90 minutes and meet at the Society Lodge.